The end of the world just keeps on coming. Climate, drones, GMOs — pick your apocalypse. No one reminds us of this more than Reverend Billy and the Church of Stop Shopping who, with their strategic theater and activism have strengthened movements that run the gamut from fair-trade coffee to Occupy Wall Street to efforts to end mountaintop removal and fracking. Fusing the forms of old-time religion with the content of contemporary struggles for justice, Billy and his Church are a jolt to our ability to recognize the crises of the present and to imagine new possible futures. 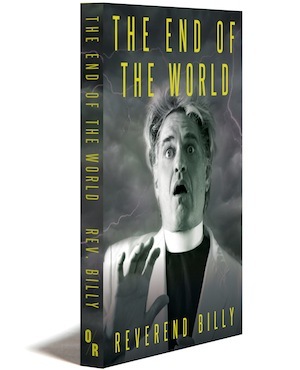 Reverend Billy’s latest book, The End of the World, is now available from OR Books. This Sunday, there will be a launch event celebrating the book and the spirit it stands for. Waging Nonviolence editor Nathan Schneider will be among those reading from the book. (Nathan is no stranger to apocalypse; his book Thank You, Anarchy: Notes from the Occupy Apocalypse is forthcoming in the fall.) Be there, because every day might be the last. Sunday, February 24, at 3 p.m. Sorry I missed the event. How did it go? When I think of the apocalypse, I always think of the Robert Frost poem fire and ice. Although these days, what with the whole global warming thing, fire seems much more likely…. I actually really enjoyed it. Billy’s new book is a poetic excursion into the experience of being in a society shopping its way into its own demise, consciously. Why do we do this? He does a pretty awesome and bizarre job of revealing the perverseness of that psychology. And the fellow readers were a nice mini-OWS reunion. Afterward, I got to catch up with Victoria Sobel about the fight to save Cooper Union.